The signs were there from the very beginning that it was going to be a difficult afternoon for Milos Raonic in Saturday’s semi-final of the BNP Paribas Open in Indian Wells. In the first set, Dominic Thiem was nearly sublime, making zero unforced errors and losing just three points on his serve on his way to what would eventually be a hard-fought 7-6(3), 6-7(3) 6-4 victory. As superior as he was – overall winning 80 of 104 serve points to 79 of 110 for Raonic – the match came down to a few points. The first set had no break points either way and probably was decided when Raonic double-faulted on the very first point of the tiebreak. He then fell behind two mini-breaks at 1-5 but got one back before missing an overhead smash badly with a chance to close to 4-5. In the second set, featuring only one break point, which Raonic erased with a 137 mph ace in the fourth game, things were again sorted out in a tiebreak. Raonic got a fortunate net cord to take a 5-3 lead and then closed things out quickly. Just how well Thiem was playing was clear in the stats numbers as the match progressed. By the third game of the final set – the 25-year-old Austrian had just one forehand unforced error to 20 for Raonic. That was astounding consistency from Thiem and he finally broke through with the only service break of the match when Raonic added to his unforced forehand error count – missing one into the net to lose serve to 2-3 in the final set. But there was still one last opportunity for him when Thiem tried to serve out the match at 5-4. The Austrian got tight and Raonic had a break point to level the set. Thiem hit a poor, seemingly desperation inside/out forehand drop shot that Raonic got to in time to handle. But he pushed a backhand long from a pose similar to the one in the picture below. Raonic would save one match point but Them, seeming to have regained his nerve, went big on a forehand approach on the final point and got a weak reply that he was able to volley into the open court to wrap up the two-hour and 31-minute contest. That it had been a competitive, compelling match had to be satisfying to tournament organizers knowing that an injured Rafael Nadal had given a walkover to Roger Federer in the other semi-final. Thiem made a remarkable 75 per cent of his service returns, an impressive stat because Raonic didn’t serve that poorly – 65 per cent of first serves made, 80 per cent of first-serve points won and 56 per cent of second serve points won. In the end, it was a much cleaner performance by Thiem who reaches his first hard-court Masters 1000 final. His winners to unforced errors ratio was 29/9 while Raonic was 58/35. The 28-year-old from Thornhill did a lot of impressive volleying on the day but still winning 38 of 62 net points was not quite good enough – and in the entire match he only managed that one break point in the final game. “Definitely some things I would have liked to do better,” Raonic said afterward. “I thought I competed and I tried to figure things out as best as I could. It was Raonic’s first tournament with new coach Fabrice Santoro, the retired 46-year-old French racquet wizard. “We both came in with the understanding that these are two very important tournaments (Indian Wells and Miami) for me in my schedule,” Raonic said about the relationship. It remains to be seen after Miami if Santoro, who also coaches No. 49-ranked Pierre-Hugues Herbert, and Raonic remain a coach/player tandem. All and all Raonic has to be disappointed because this was the fourth time in a row – not counting missing 2017 – that he has reached the Indian Wells semi-finals. Only in 2016 (losing in the final to Novak Djokovic) has he managed to go that one step further. There are the four Grand Slam tournaments and then there are the four Premier Mandatory events on the WTA tour – Indian Wells, Miami, Madrid and Beijing. Bianca Andreescu will play in one of the latter for the BNP Paribas Open title on Sunday in Indian Wells at 1 p.m. (4 p.m. ET in Canada). At stake will be 350 more ranking points and $668,010 (US) – that amount being the difference between the winner’s pay cheque of $1,354,010 and the runner-up’s of $686,000. 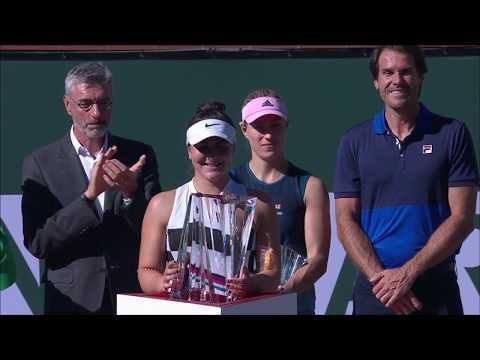 It’s been an amazing 12 days for Andreescu and she could cap it off with a win in the final over 31-year-old Angelique Kerber, the German three-time Grand Slam champion (Australian Open & US Open 2016 and Wimbledon 2018) on Sunday. Taking on No. 8-ranked Kerber will be the third top-10 player she has faced already in 2019 – she defeated No. 3 Caroline Wozniacki in Auckland in January and No. 6 Svitolina on Friday night. In all she has beaten eight top-40 players in the first 11 weeks of 2019 – (AUCKLAND) No. 3 Wozniacki, No. 39 Venus Williams, No. 28 Hsieh Su-Wei: ACAPULCO: No. 31 Mihaela Buzarnescu, No. 40 Zheng Saisai: INDIAN WELLS: No. 35 Dominika Cibulkova, No. 20 Garbine Muguruza, No. 6 Elina Svitolina. In Kerber, she is facing the most decorated of her opponents so far at the BNP Paribas Open – the German has those three Grand Slam titles and also 34 weeks holding the WTA’s No. 1 ranking. Kerber entered the BNP Paribas Open off a 5-7, 6-4, 6-0 loss to No. 31 Hsieh in Dubai and with a 2019 record of 7-4 that is now 12-4. And she had that shocking 6-2, 6-0 to No. 35 Danielle Collins in the round-of-16 at the Australian Open in January. Working with coach, former world No.5 (2004) Rainer Schuettler, she beat No. 9 seed Arnya Sabalenka 6-1, 4-6, 6-4 and Venus Williams 7-6(2), 6-3 in her previous rounds before Friday’s win over Bencic. She is in fine form and battle-tested and will be a major challenge for Andreescu. On paper once again, Andreescu’s opponent has to be favoured. But, if the superb, fearless tennis she has produced to win six matches at the Indian Wells Tennis Garden continues, it’s not hard to picture her holding the winner’s Bacarrat crystal trophy on Sunday afternoon, and raising it as the No. 24-ranked player in the world. The BNP Paribas Open 2019 edition has been dubbed its site a ‘tennis paradise.’ For many spectators the ATP Masters 1000 / WTA Premier Mandatory event is one of the ultimate experiences in tennis. It has a lot going for it – usually hot, rainless weather, spacious grounds, terrific outside courts with each being a mini-stadium and the best players in the world. Paradise may be a bit over-stating it, but the BNP Paribas Open is without doubt a fun place to enjoy professional tennis.